The AE3600 Single Pane Low-E Detector checks both surfaces of single pane glass with one test from a single side. The AE3600 is optimized for testing sheets of glass in the factory. With one push of a button, users can determine if the meter is contacting the Low-E surface or if the coating is on surface two. There is no need to conduct a test on both surfaces of glass - a real time saver in production. Lucor or other separator granules on glass can result in false readings with Low-E contact meters. Because the AE3600 does not use contact pins to identify coatings, it works every time in factory situations. Microprocessor technology in the AE3600 allows it to detect coatings even when the glass is excessively covered with Lucor or other separator granules. The new surface 4 coatings being introduced by multiple glass producers have an insulative layer over the top of the coating. Contact style meters will have problems identifying these coatings, as the meter must be pressed hard against the glass in order to penetrate the insulative layer. This will add to scratching problems, as well as general difficulty in using the contact type of meters. Because of its microproccessor design, the AE3600 Low-E Detector can identify the new surface 4 coatings regardless of the protective layer. If you're using a Low-E detector in a factory setting, you don't have time to test both surface of the glass or worry about whether seperator granules or an insulative layer is affecting your test results. Use the AE3600 and get it right - don't waste your time on cheap, inferior detectors. The AE3600 is simple to use: With one push of the button, the meter checks both surfaces of glass with a single test from one side. Competing meters require multiple measurements and process of elimination to check both sides of a single pane. Powered by a 9-Volt Alkaline Battery: The 9-Volt alkaline battery is long lasting and easily replaceable. When the battery needs replaced, 9-volt alkaline batteries are stocked at most facilities whereas coin cells (used by competitive meters) may require a special trip to the store. Low battery indicator guards against costly false readings: Competitive meters can display false results when the battery voltage gets low, and users may be unaware that the meter is reading incorrectly. The low battery feature on the AE3600 alerts users when low battery voltage could affect the accuracy of the measurement. Wide thickness range : The AE3600 can accurately identify a Low-E coating on surface 2 for glass that is up to 13mm or 1/2" thick. EDTM designs, manufactures and services Low-E Detectors in the USA with over 25 years of experience. EDTM has dedicated its entire product line to supporting the glass and window industry while continually expanding and improving its product offering based on feedback from customers. When you buy from EDTM, you know the experts are only a phone call away, and we're happy to answer questions product use and applications. 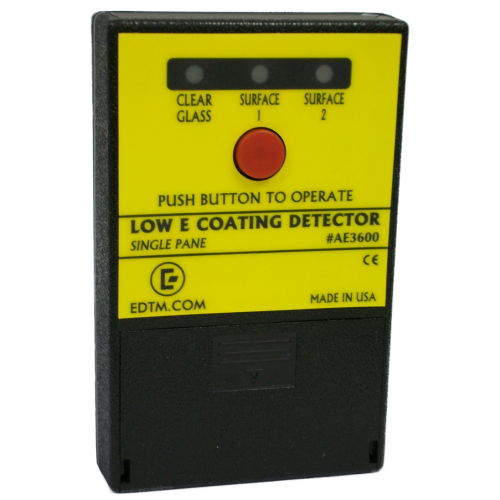 Each AE3600 Low-E Detector is manufactured in Toledo, OH, by EDTM - the only company manufacturing Low-E Detectors in the USA. EDTM stands behind its products and can repair damaged units without the hassle of tracking down the manufacturer. • Check both surfaces of single pane glass with a one test from a single side. • Does not use contact pins. There is no chance of scratching the glass surface with the AE3600. • Test monolithic glass or glass installed into a dual pane window assembly. • 9-Volt alkaline battery is long lasting and easily replaceable. • Low battery indicator guards against false readings. • Detect new Surface 4 coatings without scratching insulative layer. • Microprocessor technology allows for checking glass covered with separator granules in the factory. • Momentary push-button helps extend battery life. • Slightly larger shape prevents employees from putting it in their pocket and carrying home by mistake. • Industrial quality, rugged design. • To see dual pane ETEKT+ model, click here. 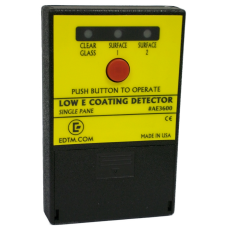 Low-E Contact Meter The CM1030 detects any conductive surface, including Low-E coatings on single sheets of glass. Simply press the meter against a piece of glass to determine whether the surface you are touching contains any conductive (Low-E) coat..